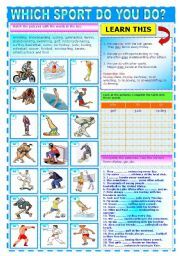 You can use this flash-card if you want to expend students´ vocabolary on the topic "MY BODY" and practise their communicative skills in different playing activities. There is an interesting task: "uncode the word" which students have to guess and draw. I hope you´ll like my WS! 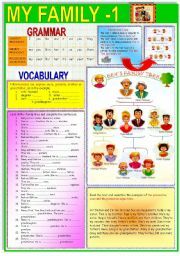 This worksheet is good in teaching possessives and Personal Pronouns.You can use it too in teaching vocabulary "MY FAMILY".I hope this WS improves your students´ practical skills in using this grammar and expends their vocabulary on the topic. I LOVE to create my lessons and use different interesting tasks!!! "FOOD" is my FAVOURITE topic! 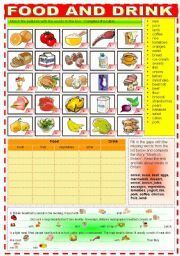 Tasks:1.Copy and complete the table with eight countable nouns (singular and plural) and eight uncountable nouns (singular). 2.Complete the sentences using the words from the box. Use There is, There are, a/an and some. TASKS:1. Look at the pictures. 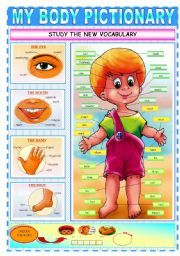 Point to the different parts of the body on your body and name them using the words from the box. Complete the sentences with “have got”. 2. Fill in the gaps and complete the text then read it and explain using the verb “ have got”. TASKS:1. Match the pictures with the words in the box. 2. Look at the pictures. Complete the table with these sports. 3. Complete the setences. Use the correct form of play, go, do. 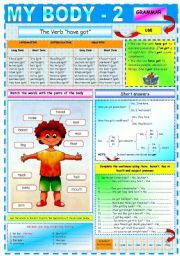 There are some more activities: 1. complete the sentences using: have, haven’t, has or hasn’t and subject pronouns; 2. use the words in the list to write the oppossites of the phrases below; 3. match the words with the parts of the body. 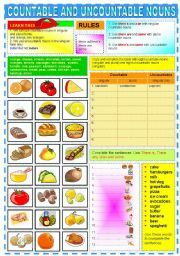 Learning English is always fun if you use different playfull activities.There is one of them here : WORD SQUARE.Students have to fill in the gaps with the words from the “WORD SQUARE”. This is the addition to the pevious one. The students have to: 1. match the pictures with the names of the wild animals and answer the questions: Where do they live? What do they eat? 2.put the verbs in brackets into the correct form of the PRESENT SIMPLE and make up the story. 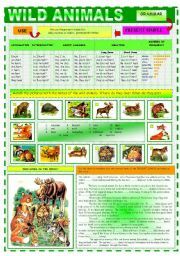 You can also use ANIMALS PICTIONARIES(1-2) with this worksheet. 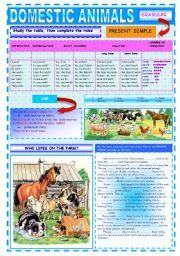 The students have to study the table (present simple)and complete the rules about forming this tense,then they have to put the verbs in brackets into the correct form of the PRESENT SIMPLE and make up the story "Who lives on the farm"
This is my favourite Valentine´s Card!! !